I managed to solve this algorithm challenge but I don’t understand how this code works? You wrote it, so why don’t you walk us through what you were trying to do and how you expected it to behave, and we can help fill in the holes? 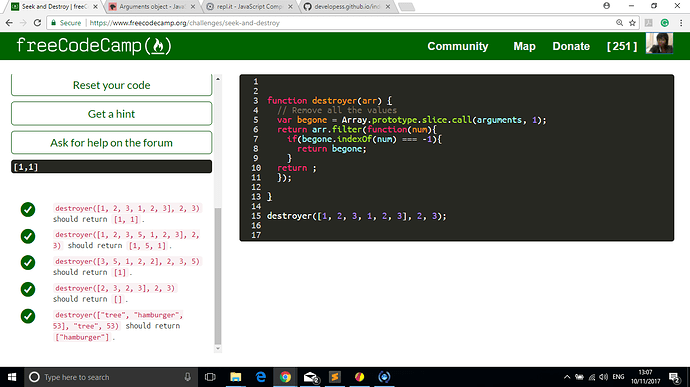 I wanted to use the arguments method to find the arguments outside of the array. Then I used the filter method to create a new array if ‘begone’ can be found in ‘num’, and I think I wanted to return the array if the argument was true. What I don’t understand is why the empty return statement allows the code to run? is actually going to return the final value. The single return; will never execute. Ok, thank you, I understand it better now.